Almost two years have passed since the publication of Thomas Piketty’s Capital in the 21st Century, and the larger genre of economic research on the distribution of wealth has exploded since that time with complementary arguments being advanced by economists Emmanuel Saez and Gabriel Zucman, as well as economic popularizes on the left including Paul Krugman and Brad DeLong. Even the political campaigns have weighed in, with the Bernie Sanders movement regularly touting a claimed explosion in inequality. While a veritable inequality scare is underway and perhaps even accelerating at the moment, the empirical premises that it was based upon have not fared very well in the past two years. Piketty’s work came under intense scrutiny from the Financial Times as well as in my own work on the subject with Bob Murphy. In a different vein of the literature, Wojciech Kopczuk has provided an important discussion of the difficulties associated with measuring wealth inequality in the United States, including a healthy dose of skepticism about the ballooning inequality claims that are found in a much-touted paper by Saez and Zucman. Two new developments give us further reason to believe that the post-Piketty “inequality scare” is just that – a politicized frenzy premised on ideological preferences for higher taxes, but with little actual connection to the empirical performance of the U.S. wealth distribution over time. The first is a new paper by Jesse Bricker and a team of economists who work on the Federal Reserve’s Survey of Consumer Finances (SCF), which contains one of the main approaches to measuring inequality. Bricker et al use the historical SCF to analyze the competing “capitalization” estimate of wealth offered by Saez and Zucman. 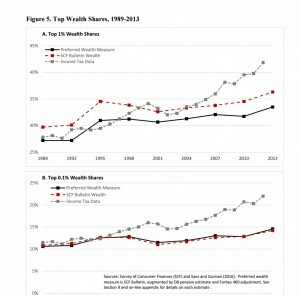 They present both the “raw” SCF reports on wealth ownership at the top of the distribution as well as an adjusted “Preferred Wealth Measure” that takes into account a number of alleged deficiencies in SCF from Saez and Zucman’s paper. The adjustments account for the much-discussed “Forbes 400” issue, which the SCF intentionally omits due to privacy considerations (though it also employs its own sample weighting to account, in part, for the omission), and for another issue of wealth from defined benefit pensions that income tax estimates such as Saez-Zucman overlook. Taken in full, the SCF measure places wealth inequality growth much closer to the older Kopczuk-Saez estate tax estimate, which shows a very slowly increasing or perhaps even flat trend line for several categories of top wealth shares since the 1980s. In what is perhaps an even more telling indicator of the flaws of Saez-Zucman, the almost all of the observed increase in both the raw SCF and the Forbes-and-Pension adjusted “Preferred Wealth Measure” took place between two adjacent surveys: 1992 and 1995. As their Figure 5 displays, the distribution for both the Top 1% and Top 0.1% has remained essentially stable since 1995, exhibiting at most an exceedingly modest growth of a few percentage points. The Saez-Zucman is overlaid below in gray, showing an exploding inequality pattern that simply does not seem to exist in the SCF data. A second strike against the ‘Inequality Scare’ literature may be found in a new critique of Piketty’s own empirical presentation by the distinguished economic historian Richard Sutch. This working paper dives into Piketty’s Figure 10.5 and attempts to replicate its construction, much as Bob Murphy and I did in our own critique of the Piketty empirics (my own step by step display of Piketty’s assembly process may be found here). 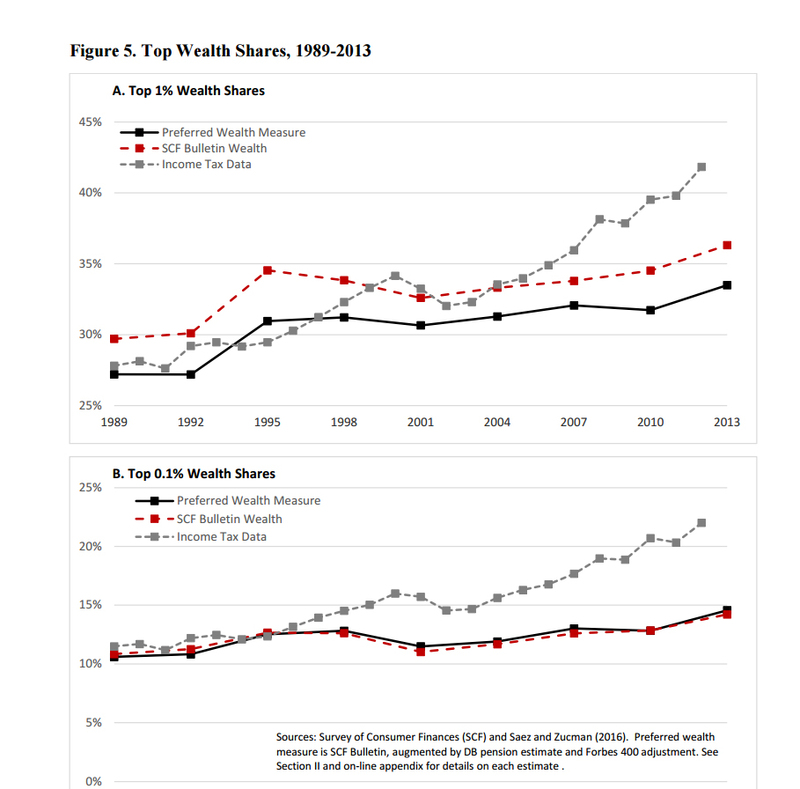 Figure 10.5 was one of the most widely touted graphs in Piketty’s book as it purported to show his famous “U-shape” prediction about the presence of inequality over time in the United States. In his book, Piketty portrays a sustained pattern of exploding inequality since about 1980, which he then attributes to the Reagan era tax cuts. Much of the subsequent political argument made by Piketty, as well as Saez and Zucman, derives from the presumed existence of this “U” as it allows them to causally blame the tax cuts for the ‘Inequality Scare’ and lobby for new punitive rates on top wealth earners. The paper notably does not contest the value of making a historical inquiry into inequality, be it Piketty’s version or another. But Sutch does strongly caution other scholars against uncritical acceptance of Piketty’s own numbers. He also finds that Piketty’s methods, though transparent in the sense that he shared his data publicly, were plagued by poor documentation and highly questionable decisions that alter the shape of his graph in ways that seem to match and dramatize his long term historical narrative. It’s worth noting that Sutch’s replication study independently verifies most of the same problems that I discovered in my own attempt to reconstruct Piketty’s Figure 10.5, as well as similar work by Chris Giles of the Financial Times. These independent findings also stand in marked contrast to a very strange line of criticism that was pushed against my own work by economics blogger Daniel Kuehn last year, who claimed over the course of several increasingly aggressive posts that Piketty’s “adjustments” were simply routine empirical practices to “harmonize” different inequality series. I suspect that Professor Sutch and I might have differences of interpretation in our respective takes on tax policy in the 1970s and 80s, or even the driving mechanics of inequality. Yet from a strict matter of data analysis and methodological best practices therein, Sutch found many of the same deeply problematic decisions that afflict Piketty’s main inequality chart for the United States. Those problems are sufficient to question the chart’s empirical validity as a measure of historical events. I’d only add that, as Piketty’s entire theory purports to be derived from an empirical demonstration of the same events, any judgment on its performance should follow suit. This entry was posted by Phillip W. Magness on Wednesday, March 16th, 2016 at 2:42 pm	and is filed under Uncategorized. You can follow any responses to this entry through the RSS 2.0 feed. Both comments and pings are currently closed.